An opinion piece about the different ways teachers view misconceptions. This article is all about the falsehoods about misconceptions. 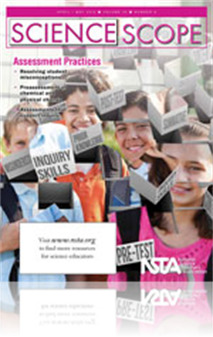 The author lists the following false misconceptions: All misconceptions are the same; all misconceptions are major barriers to learning; only “those” students have misconceptions; Misconceptions are a bad thing; Misconceptions must be fixed; Misconceptions come mostly from experiences outside of the classroom; and Identifying misconceptions is formative assessment. With such a focus on misconceptions today this article provides a very valuable point of view that should be presented to all educators. Misconceptions is a general term to describe misunderstanding of science concepts by students. A formative assessment is not really formative unless a teacher uses the assessment to determine a misconception and then tries varies teaching methods to help a student discover for themselves the correct scientific information. Just telling a student that something is a misconception and giving them the right answer will not always solidify the correct answer. This article gives a clear picture of the above. Keeley provides insight into what she terms “practitioner misunderstandings” about misconceptions. I love how she addresses the use of misconceptions as a teaching too. “It is important to understand that the word misconception is a general way of lumping together students’ scientifically inaccurate or partially accurate ideas. Once a misconception is identified, teachers should delve further to understand the type of misconception the student holds.” Keeley identifies the misunderstandings as: All misconceptions are… the same; major barriers to learning; only “those” students have them; are a bad thing; must be fixed; come from experiences outside the classroom; identification of misconceptions is formative assessment. It is powerful to understand all misconceptions are not major barriers to learning. Keeley makes and excellent point when she says, “A conceptual misconception warrants greater attention than a trivial factual misconception. When developing assessments that probe for students’ misconceptions, it is important to focus on key conceptual ideas rather than minor facts.” For me, this reinforces the idea assessment should be ; on whether or not students are grasping the big idea of Science instead of the minutiae, which wall amusing, in the overall scheme of things is not as critical for student understanding. Learning should be transparent. Students should not have to guess what will be on the test, it should be obvious. Finally, I appreciate how Keeley encourages us to,” Use students’ ideas as springboards to guide them through a process of conceptual change. Understanding is a continuous process that happens throughout a students’ education as well as teachers’practice.” As always, Keeley provides me with thought provoking insights that cause me to ponder my practice.